During the Nazi occupation of the Netherlands, Anne received a diary as one of her presents on her 13th birthday. She began to write in it on June 14, 1942, a month before going into hiding with her father Otto, her mother Edith, her older sister Margot, and another family, Hermann van Pels, his wife Auguste, and their teenage son Peter. The group went into hiding in the sealed-off upper rooms of the annex of her father's office building in Amsterdam. The rooms were concealed behind a hidden door. With the assistance of a group of Otto Frank's trusted colleagues, they remained hidden for two years and one month. This is the climate the book was written in. Anne knew that if her family was captured by the Nazis, they too would be sent away to a camp for death. However, she managed to keep her eyes on the business of growing up and looking for the good in human beings. They were betrayed in August 1944, which resulted in their deportation to Nazi concentration camps. Of the group of eight, only Otto Frank survived the war. Anne died in Bergen-Belsen from typhus in early March, about two weeks before the prisoners were liberated by British troops in April 1945. During the story, we can see the way Anne describes all the aspects of her life as her relationship with her family: she was very close to her father and so distanced from her mother; she felt she had nothing in common with her, and a very detailed description of her sister's intelligence and easy going personality. As a patron of her character (she was very demanding and absolutely sure about what she wanted and how she wanted), she didn’t like the others initially, particularly Auguste van Pels and Fritz Pfeffer. However, she and Peter became very close, though she remained uncertain in what direction their relationship would develop. The book is a short summary of all the sufferings and fears faced by Jewish during the Nazi's Holocaust, but specially from a very young girl's point of view. Changing her life, her way to face and enjoy it, getting an extraordinary adaptation due to conditions. It gives a wide perception of how this kind of situations can build a vibrant and brilliant artist and also, how love can help to forget all the horror outside. The author, Anne, shows herself able to write about all the experiences and emotions she goes through during her time in this small space. She keeps the reader interested in the possible stories she is close to live and trying to be in her place... It means, trying to image how would be the reader's reaction if he had to left everything, the school, his friend, his freedoom, to live in a cold, unknown and little place just with the company of his family and some people coming and going? My first experience to the book, was a successful moment in my reading process in high school. 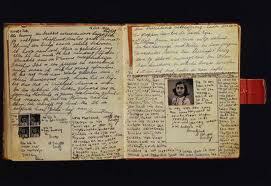 It is the only one from the author: the Anne Frank's Diary is an autobiographical book by Anne Frank, written during the years were the toughest times of World War II in Europe. After the war ended, Otto Frank (Anne's father) returned to Amsterdam, he finds the diary through the papers left by the Gestapo in the secret annex. At first, Otto Frank circulated her diary among his friends and relatives as a memorial, but a Dutch university professor urged him to publish the book. It was first published in Holland in 1947. Since then it has been translated into thirty-one languages.